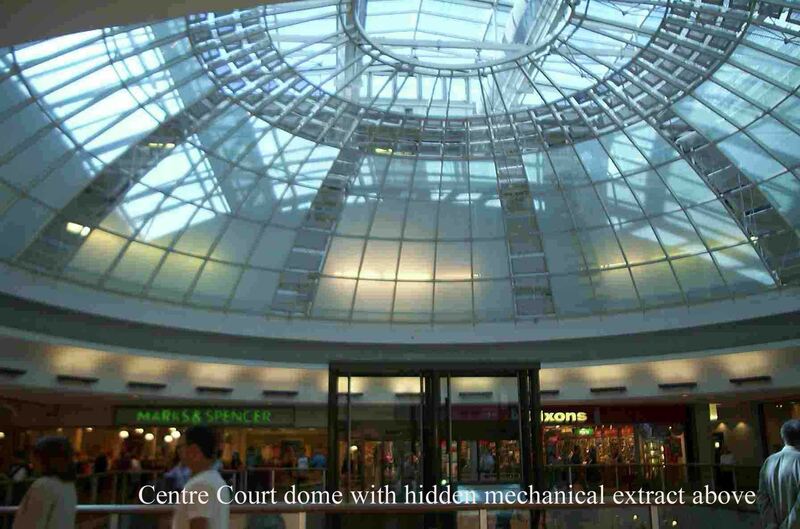 Centre Court, Brent Cross shopping centre, North London. Centre court, forming the intersection of four shopping malls in this 2-storey extensive shopping centre, was previously a sterile area except for a feature fountain, a wall climbing lift and escalators. 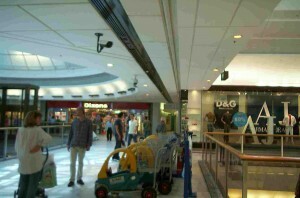 The developer proposed to remove the fountain and install three retail display kiosks. There were two parts to my work. First, to check that the smoke extract management system would cope with a 10MW fire on the floor below the dome extraction, and this was done using the well-known axisymmetric smoke plume equation. Secondly, the fire consultants had provided calculations for space separation resulting from a black-box computer program which could not be directly checked by building control so I undertook my own calculations for the design fires adopted using the classic configuration factor for a rectangular radiator representing the flame and the implicitly permitted incident thermal radiation intensity (12.8kW/m2) under building regulations. I checked that the fire scenarios were reasonable and used my own spread sheet calculation for checking the incident radiation intensity from the flames. Trocadero Development, Phase 1A, Piccadilly, London. Assessment of stability and fire resistance of external cladding of faience. Retail Shop Premises at 15/16A Bradford Street, Walsall. Assessment of fire resistance of steel/timber joisted floor. Client: Watkins Group Woodgate International, Edgbaston. Site survey and advice on cavity barriers above compartment walls. Assessment of hazard to M&S occupants above a precast concrete floor containing expanded polystyrene void formers due to fire in a train below. Client: Norman Jones & Rigby, Southport, 1979. Client: Watkins Group Woodgate International, Edgbaston, 1979. EMI Staff Restaurant and Sales Shop. Assessment of fire resistance of fibre reinforced concrete columns. Assessment of fire resistance of prestressed concrete double T units.